Meijer is expanding a test of its streamlined shopping checkout program that provides customers yet another way to shop its stores and save time. The program, called “Shop & Scan” enables users to scan bar codes on items as they shop and bag their groceries while they move through the store, dramatically decreasing checkout time. 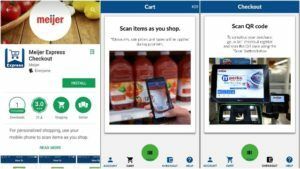 The Shop & Scan technology works with Meijer’s popular mPerks program via a free app that customers can download through the App store. Once a customer has completed their shopping, they simply scan their phone at a self-checkout lane and pay, making the checkout experience quick and easy. All Meijer Apps can be found by searching for “Meijer” in the Apple or Android app stores. Meijer launched the initial pilot of the Shop & Scan service in November at Grand Rapids, Michigan-area stores in Standale, Rockford, Walker, Grandville, and Jenison, and two stores in Holland, Michigan. Since then, more than 12,000 Meijer customers have downloaded the app. The Shop & Scan program will begin rolling out in other Meijer stores in the coming weeks and will be available at all 235 Meijer stores by the end of the summer.